Palladium one ounce coin or bullion are the most popular ways of investing in palladium. 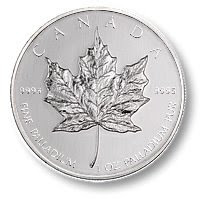 The most popular palladium one ounce palladium coins are the Canada Maple Leaf. The most sought-after bullion is the palladium one ounce Pamp Suisse bar. This is just going to be a quick entry for those who want to buy palladium one ounce now and aren't sure what you can trust to be something you can resell later. 1. Canada Maple Leaf palladium one ounce. 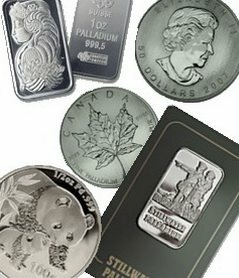 The Canada Maple Leaves have by far been the most popular palladium one ounce coins of the past few years. They only minted these coins in 2005, 2006, and 2007, but they made nearly 150,000 of them. If you have a 2007 Maple Leaf let me know. I need it to finish off my collection! Palladium Maple Leaves are shipped in their plastic container and for numismatic value, should be kept that way to be easier to sell. 2. Pamp Suisse 1 oz. 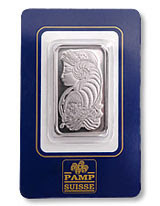 Palladium one ounce Pamp Swiss bars are also very popular. I didn't look up the number minted, but I do believe they are more readily available than the 150,000 palladium one ounce Maple Leafs. They are packaged in a nice holder and even show the serial number and how many are minted. So, they should be easier to sell because everyone knows what they are. But, the Maple Leaf might demand more of a premium. 3. Russian Ballerina palladium 1 oz. There are also around 150,000 of these in existence. They are pure palladium, one ounce, and should be in a protective case. However, there are about 10 different poses for the ballerina and although it has the palladium one ounce value, to a collector it may be worth much more. So, that should get you started. The USA is making Stillwater coins and bullion and there are a few others. We'll get to those later. For now, any of these should be a solid investment and when you want to sell, you shouldn't have any troubles!